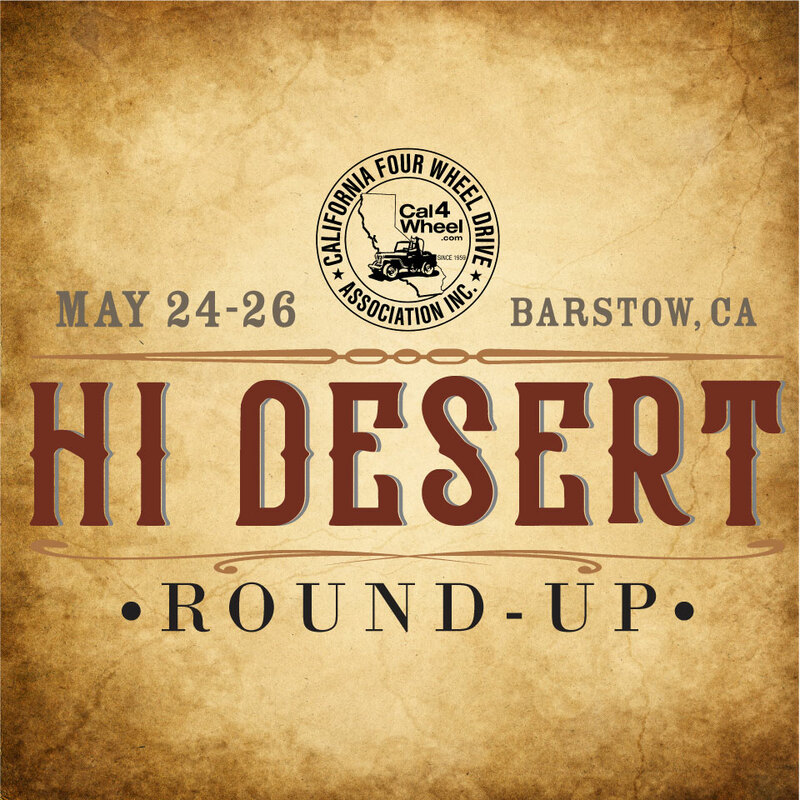 Registration for the Hi Desert Round-Up being held May 24-26, 2019 in Barstow, CA. Registrations include a free T-shirt (if registered by May 3, 2019), 1 dash plaque, 1 raffle ticket and your choice of runs. Help us offset the use fees that BLM is charging us for the event by paying this optional $5 daily fee. Vehicle registration comes with one dash plaque. Extra dash plaques are $2 each. Official event T-shirt in small. Official event T-shirt in medium. Official event T-shirt in large. Official event T-shirt in XL. Official event T-shirt in 2XL. Official event T-shirt in 3XL. Official event men's tank top in small. Official event men's tank top in medium. Official event men's tank top in large. Official event men's tank top in XL. Official event men's tank top in 2XL. Official event ladies' tank top in small. Official event ladies' tank top in medium. Official event ladies' tank top in large. Official event ladies' tank top in XL. Official event ladies' tank top in 2XL. Official event long-sleeve T-shirt in small. Official event long-sleeve T-shirt in medium. Official event long-sleeve T-shirt in large. Official event long-sleeve T-shirt in XL. Official event long-sleeve T-shirt in 2XL. Official event long-sleeve T-shirt in 3XL. Official event hooded sweatshirt in small. Official event hooded sweatshirt in medium. Official event hooded sweatshirt in large. Official event hooded sweatshirt in XL. Official event hooded sweatshirt in 2XL. Official event hooded sweatshirt in 3XL.